Studying at the Film Academy in New York is like living at the crossroads of the world. New York City has a way of thrilling the senses that is as constant and direct as the subways rumbling beneath its surface. For size, diversity of landscape, people, and culture, the city is unparalleled. One can hear dozens of different languages, choose from the cuisine of six continents, and rub shoulders with diplomats, designers, machinists, or musicians on any given day. New York is a city of distinct places: the bustling shops of Chinatown and Spanish Harlem, the stately museums, the neighborhood brownstones. New York is about neon lights, taxi horns, street music, bookstores, landscaped parks and ten million inhabitants working together; each as unique as the next. New York City is dynamic, rich in layers, and always alive. This makes it the perfect training ground for filmmaking and acting. The city challenges and stimulates students on every shoot, every step of the way. The New York Film Academy’s classes for teens are located in the Financial District. Our summer teen facility houses two dance studios, editing labs, an equipment room, screening room, classrooms, and open area lounges. The school is situated across from Bowling Green, just a few blocks from Wall Street and the New York Stock Exchange. It’s also a short walk from the student residential building. A walk or short train ride takes the student into the heart of Soho, Tribeca, Little Italy and Chinatown, Greenwich Village or the Brooklyn Bridge. A twenty-minute train ride brings students to Columbia University, Coney Island, Central Park or Harlem. Film shoots—student, commercial, and Hollywood—abound in New York. Simply by volume alone, New York is indisputably the greatest center of independent film production in the world. Like many filmmakers, novelists, playwrights, and painters, our students find that New York itself helps shape their artistic vision. The city is not only a setting for their stories, but also an active element in the lives of their characters. Teen students reside in a student residential building in lower Manhattan, monitored 24/7 by doorman security. Students live in fully-furnished rooms. Rooms include refrigerator, microwave, internet, air conditioning, and a private bathroom. NYFA makes every attempt to keep all of our students on the same floors. Counselors live on each floor with our students and enforce a strict curfew. The housing arrangement is something parents may want to discuss with their child before the summer, as it requires a certain level of maturity and responsibility on the student’s part to be accountable for obeying all the rules set forth. We provide snack foods like bagels and cream cheese, granola bars, fruit, and juice. For lunch and dinner, students get to explore the surrounding area with their classmates as long as they check in and out with a counselor. Students do have the ability to roam freely to patronize establishments in these areas. Students must inform their counselors of their destinations and they must adhere to our Buddy System. No student is allowed to roam alone. Although students may explore the area, they must stay within a certain radius of the housing and school facility. Any student who has a cell phone must have it on and charged at all times. We request that any student who has a cell phone provide the RA’s with the phone number so that we always have a means of contact. Students are escorted on foot or via public transportation to and from the student residential building/NYFA classroom facilities for class and/or shooting. 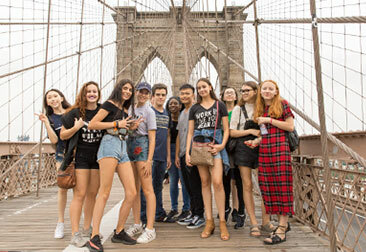 Students shoot on location in New York City in crews of 3-4 students and are always supervised by Teaching Assistants during these productions. In case of medical emergency, students are taken to the nearest hospital. Please note: Parents who wish to allow their children to leave the residence or campus without supervision, must submit a written authorization for every occurrence to the New York Film Academy. Even with permission, excursions without supervision may still be limited as determined by NYFA staff. After a long and exhausting day studying and practicing their area of study, students residing in our housing facility take part in the many exciting activities available in the Big Apple. We visit some of New York’s fantastic museums and see some quintessential New York sights. Nightly activities can include movies, bowling, and walking through iconic NYC neighborhoods, such as the West and East Village, Tribeca, Chelsea, and SoHo, all under staff supervision. Saturday activities are mandatory for housed students and include daylong trips within the five boroughs that can include, but are not limited to, visiting Coney Island, attending an IMAX screening, and exploring Central Park. New York Film Academy counselors living at the student residential building plan and supervise these outings. Non-commuting students reside a short walk from the school in a newly renovated residential building comprised of modern, spacious dorm rooms with a private bathroom, refrigerator, microwave, internet, and air-conditioning in every unit. With lots of light and plenty of storage, each room comes furnished with beds, chairs, desks, and lights. The accommodations include 24-hour security and laundry facilities on the premises. See Housing Options for details. Tuition includes all cost for instruction and use of equipment and software. Tuition does not include transportation, room and board, and personal expenses. Please note that curriculum, dates, and prices are subject to change. Click here for housing cost. * These courses are designed for students who have completed a prior prerequisite program of similar length and same subject at the New York Film Academy.